Grate the bar of soap using the finest side of the grater. (You can also chop up the bar and drop it into a food processer.) You’ll want very fine soap flakes especially if you use cold water for laundry, so it’s worth the time it will take. Then simply add the other ingredients and mix until well combined. Use one Tablespoon per load, two for a very large or heavily soiled load. 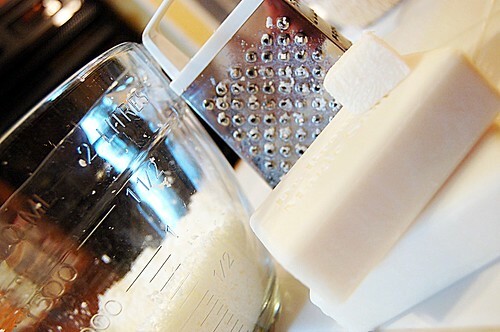 This recipe makes enough laundry soap to fill two pint sized canning jars. Dr. Bronner’s soaps come in a variety of scents, even unscented for baby laundry or for those with sensitive skin. I used peppermint just because it smelled so fresh and clean. Love it! I’ve also stopped using fabric softener in favor of vinegar. Yes, it sounds ridiculous, but my sheets are so soft and comfy! You may have a faint scent of vinegar when you open the washer, but by the time your clothes dry any hint of vinegar is gone. 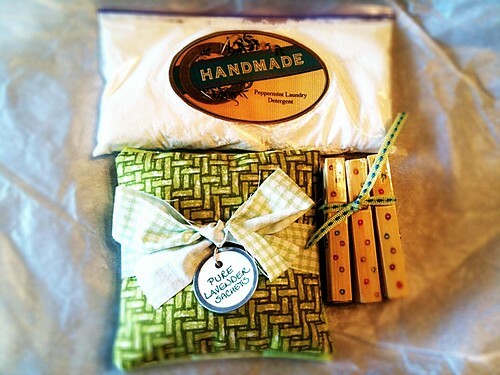 A couple friends volunteered to test out my new soap, so I’m sending them little laundry starter sets of soap, a couple lavender dryer sachets and six “bubble” clothespins. Wouldn’t these make nice housewarming or hostess gifts? Hi, Elizabeth! I’ve become “iffy” about homemade dishwasher detergent, but the laundry soap is working BETTER than the expensive brand name stuff I paid so much more for! A friend suggested we should be making extra for the local food pantry, so I feel a need to share what I’m making. The vinegar works great, it really surprised me! I am half through my first batch of homemade detergent and I’m not totally in love so I’m going to try this concoction next. I’ve been adding vinegar to my laundry for several months (even before making my own detergen) and have noticed that my dark colors are much more bold. Especially my blacks, I didn’t realize how muted they had gotten from the ‘ick’ left by commerical detergents. This recipe has been a REVELATION in laundry to me! Thank you. I also use the vinegar in the rinse water trick, and there’s absolutely no smell when the clothes come out of the dryer. Just clean smelling clothes, fluffy soft towels and colors so bright & bold I hardly can believe it. Thanks again! A friend of ours recently had a house fire and lost everything. We bought him laundry basket and filled it with a couple sets of dishes, bath and kitchen towels and laundry soap to help him get started again. It might seem like a weird gift, but I’m sure he’d rather spend his money on so many other things rather than detergent. 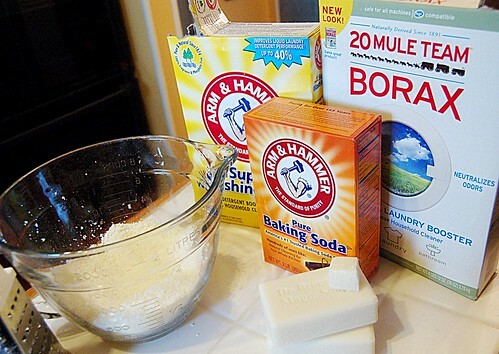 Hey Sarah, What is the difference between laundry soda and baking soda? Also, do you have city sewer or septic… I am pretty fanatical about using liquid soap on my septic system, although really I could just add hot water and make it liquid, eh? I have city water, but my friend Kim just moved to a house with a septic tank and she wondered the same thing. She has really hard water and we’re currently doing a little experiment to see how well a tablespoon of detergent dissolves in her water and mine. I’ll let you know if we learn anything. :) There are a lot of liquid homemade recipes out there, just Google and you’ll find a lot if you’d rather try that. Sarah, Six months ago, I made a five gallon bucket, which cost me a whopping $3.00 of materials. I STILL have some left. This means I will spend less than $10 annually for laundry detergent. Prior to this I was spending $100 annually! A savings of more than $90 a year! That is enough to pay my electric bill for one month! Or fill my tank twice! I have used this same recipe and I am very pleased with it. I AM a vegetarian, and we’re both allergic to most additives, so this could be a winner! I already use vinegar to clean glass, the inside of the DW (just a cup to run an empty load once a month) and the same for my washer, as well as our wood floors. This is my absolute favorite for sheets! You will probably smell a hint of vinegar when you take them out of the washer, but by the time they’re done in the dryer they’ll just smell CLEAN. Well, I always use lavender sachets in the dryer with sheets, because the one thing I missed from fabric softeners was the scent. Now I have that soothing lavender scent from the lavender itself.